Kia concept car hints at Juke rival | What Car? A Kia concept car that could hint at a new rival for the Nissan Juke will be unveiled at the 2013 Geneva motor show. Kia has released images of the unnamed concept car, however, no accompanying technical information has been revealed. The pictures suggest a supermini-sized car. At the front there's a new interpretation of Kia's 'tiger nose' grille, which flows smoothly into slim, angular headlights. The rear lights echo the shape of those at the front, while there are blacked-out front pillars, like those on the Kia Soul. The concept car's profile is sleeker than the Soul's, however, and bulging wheelarches and a lower front end give it a much sportier appearance. At the 2012 Paris motor show, Kia sources told What Car? 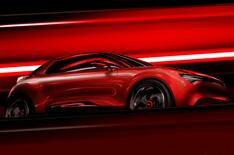 that the company was considering adding a Nissan Juke rival to its range, and the Geneva show car is likely to provide strong clues to how it will look. Any new model would be in addition to the Soul - a replacement for the current car is due later this year, and rumours suggest it will be unveiled at the New York motor show in March.